Sadly Pip and Roger are selling their boat. 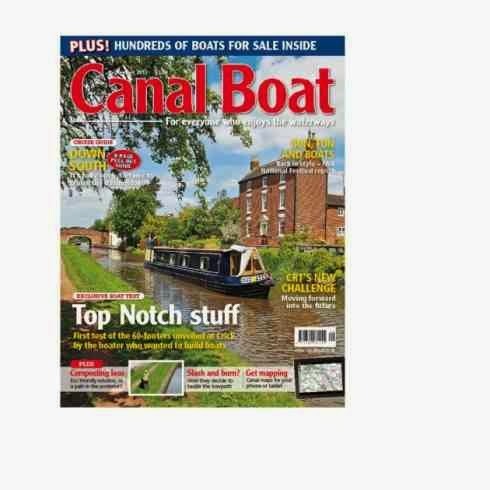 As a Blogger I have posted this in the hope someone might be interested or know someone else in the market for what is a fine boat crafted by Beacon Boats. They are asking all fellow bloggers to post this sale to their blogs. I've seen the orthopedic surgeon and he's confirmed I have arthritis in both knees, and recommended I have a TKR--Total Knee Replacement of my left knee. I don't have an exact date yet but surgery will be scheduled for some time in January at Warwick Hospital. Les and I must attend a physiotherapy class together in mid-December to learn more about what is to be expected and how to do the exercises necessary to strengthen the muscles in and around the knee. After four years of nearly non-stop trouble with my right S-I joint (Sacro Iliac joint) popping out of place and causing my right leg to drop down and be anywhere from 1/16th to and 1/8th of inch longer than my left leg, requiring chiropractic visits to put it back in place, I have finally hit on how to get my S-I joint back to where it belongs on my own which is great because it is this issue that has brought me to my knees, literally. So I do my knee exercises given to me by the physiotherapist I've seen recently, as well as a very good exercise to strengthen the muscles in my lower back to hold my S-I joint in place. I walk with crutches whenever we leave the boat for any length of time, which helps take the stress off my knees, and I am grimly looking forward to being on the other side of this surgery and recuperation. From all accounts it is extremely painful. I've had eight surgeries in my life before moving to the UK and I've never once had any pain afterward thanks to the amazing pain control available in the U.S. I tend to bounce back from surgeries and recover fairly rapidly. I am taking the examples of two people as my focus points: Graham on NB Matilda Rose who has been there and done it, and is offering me pointers and support for which I am extremely grateful, and Sir David Attenborough who is 93 and had both his knees in the last two years. He said before the surgeries he could only shuffle along painfully for a few feet; after recovery he can now walk for a mile and a half with no problems at all. My mother had her left knee replaced due to arthritis, at age 70 in 1993. She was in shock afterwards as the procedure was not really explained to her and as she sat on a chair at home doing exercises she told me, "They cut my leg in half is what they did--and no one told me it would hurt so badly." I am a pretty tough old bird. 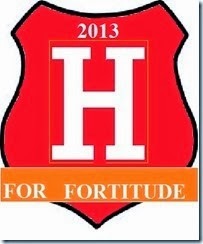 I've had to be to survive this life, so I hope it stands me in good stead now. I am concerned about pain control because there are so many drugs I cannot take--I have a long list of allergies and toxic reactions to most synthetic drugs, and to many antibiotics. I do best with opiods and I've told all this to the surgeon along with giving him the list of drugs to which I am allergic. I don't need to control others but I loathe losing control of myself. It comes from way back in my childhood. Loss of control often causes me to blank out on the present, as I go somewhere else in my head for awhile until I can gain control of myself and my situation again. This does not make me a good patient and I worry about Les--about whether he will be able to take care of me during recovery and whether he will survive it. Living on a boat will make this quite challenging for us both, but what is life without a few of those, eh? Jaq had two appointments at Warwick hospital, one for Physio and the other with a consultant both concerning her knee so we had to decide how to travel into Warwick. Our mooring has been for the past 14 days been Hatton near the station which was handy for a Tesco order and Rowington that had space for log cutting and good views over the countryside. Downside of Hatton was the trains although it was not too noisy for a few days and the station was handy for a trip into Leamington Spa mostly to satisfy my hunger for fresh fruit. Beside the hospital we had another reason to choose our journey into Warwick, we are getting low on diesel. Down to half a tank with our two spare 5 gallon Jerry cans empty. Winter is the time we like a full tank plus reserves so the decision was made to take the boat into Warwick. The Hatton flight totals 21 locks plus the two at Cape. 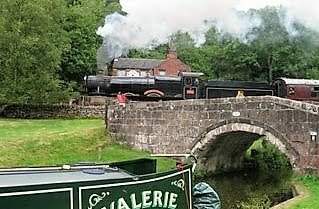 Now we have had offers of help to bring the boat down the locks and we are very grateful to those who offered but we hate to make plans too far ahead and therefor feel bad not being able to give you lovely people some notice. We stopped at the Saltisford Trust arm and loaded on six bags of coal but sadly they do not sell diesel. This decision was made Saturday after consulting the weather forecast and we moved down the locks Monday during a break in the stormy weather of late. Storm Abigail had come in from the Atlantic and blown a few of my cut logs off the roof and now as I write this (Tues. evening) another storm, Barney is buffeting the boat with 60mph winds. Never mind I have four mooring pins holding us into the bank directly opposite the hospital, and that was how we traveled for Jaq`s hospital appointments. She will let you know about that soon. So one of our reasons to travel has been dealt with and that leaves the diesel problem to be sorted. In this area of the canal system fuel supplies are limited with no fuel boats passing through the Hatton locks and just the north Stratford canal having a boat yard but only after passing through 19 locks and of course 19 back again. Warwick has two boatyards, one that holds no stock during winter because of limited sales and the other that won`t allow boaters to declare their percentage for full tax to be charged even though the UK government state the boater can declare his own percentage. Basically you pay full tax for propelling the boat and a reduced tax for heating and generating electricity. This time of year boats are not moving so much so less diesel is used to propel the boat but this particular boatyard wants to tell me what i`m going to use by charging 60% propulsion and 40% domestic. Of course readers abroad will probably have guessed it`s all to do with the EU and you are correct. Getting hot under the collar after typing EU so we will move on. 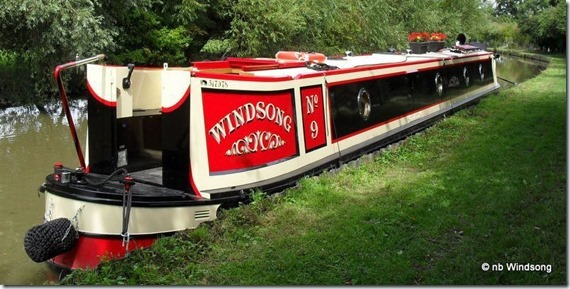 There is a fuel boat that comes into Warwick about once a month and we have arranged to meet him around the 26th as we leave and he enters Warwick. We will fill up and buy more coal that together with all the cut logs on the roof will keep us warm well into winter. 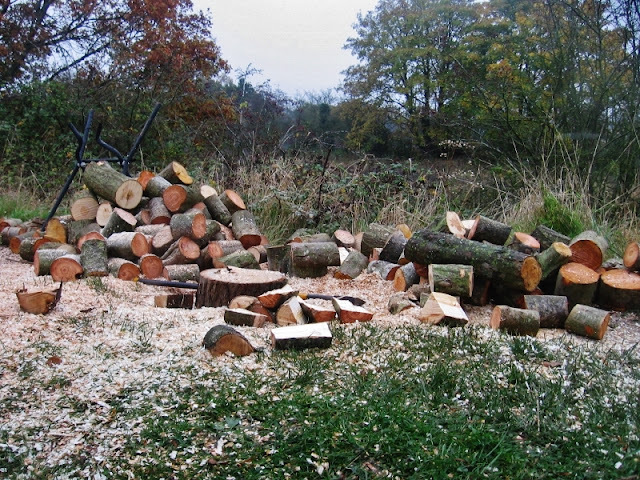 The towpath here at Rowington widens for about a boat length, giving me enough room to cut logs. The nice thing about this site is the break in the trees giving that feeling of openness. The view across the canal overlooks a few scattered homes. 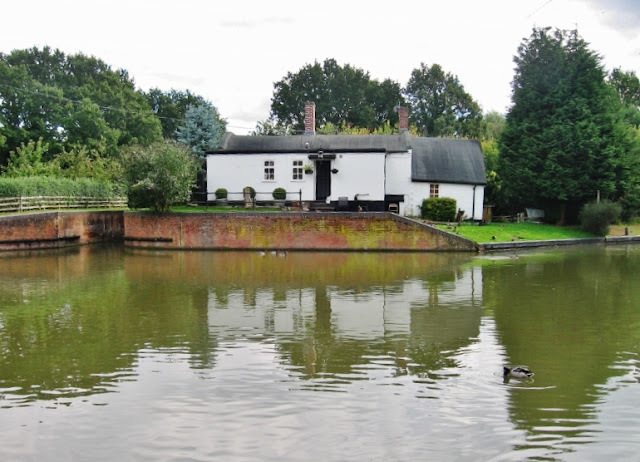 The canal is on an embankment giving us chimney top views of the Warwickshire countryside. From the mooring heading towards Warwick the fields both sides are full of Norway Spruce and Nordman Fir trees. Back at the mooring there was a single Spruce growing close to the towpath so I have named the spot Christmas Tree Mooring. On the way we passed this ex working pair moored up on the offside by a fishing lake. The sign says they are for sale but it would take a rich enthusiast to restore them. The number on the motor brings up the name Mabel a 70 foot wooden hulled boat. Part way down the Hatton locks CRT have workshops and some of the workforce were loading a skip. The whole lot in both pictures was dredged from the canal through Leamington Spa. Strange sort of person that uses the canal as a dump. Seats, cycle frames and all sorts of metal objects including a fridge. Jaq brings the boat into another of the 23 locks we are to go through today. We actually did the main flight of 21 in about 3.5 hours.and our timing was good with no rain and little wind. 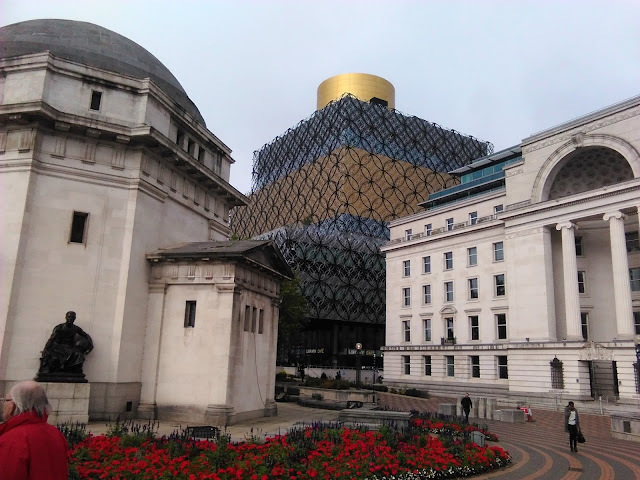 Just been looking through my photos so here are some pictures of buildings old and new in Birmingham city centre. Must go back after Christmas as there is so much to see and do. 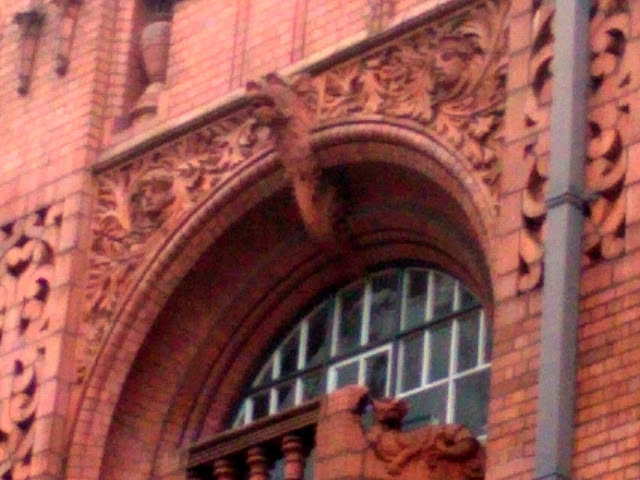 Near Snow Hill station. A different view here. Selfridges department store. Click here for some more images. Town hall built early 1930`s. In the past has been a venue for all types of music. 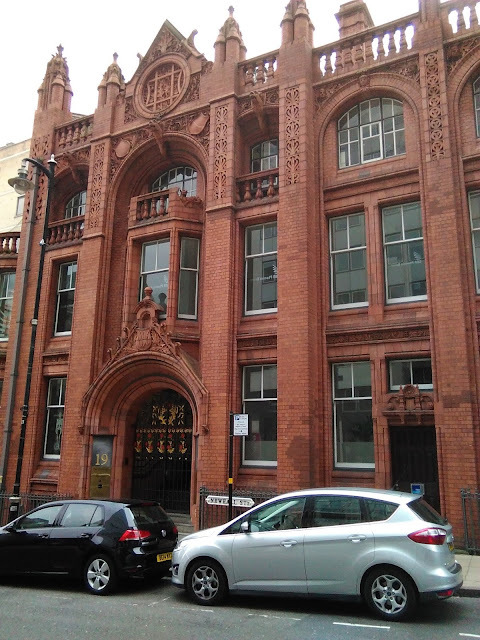 Elgar and Mendelsohn, The Beatles and The Stones this building has heard it all. The two latter groups appeared live. The refurbished New Street Station with the Grand central shopping centre above the main concourse. Close up of the right side below the Grand Central name. As you run frantically for your train you can watch it depart in the reflecting metal clad building. Personaly I think it`s horrible. 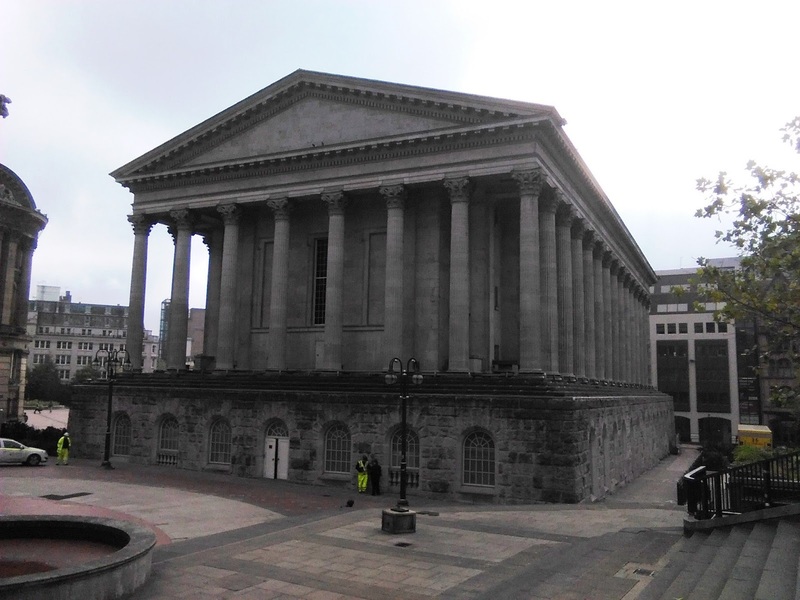 Hall of Memory, Library and Baskerville House. 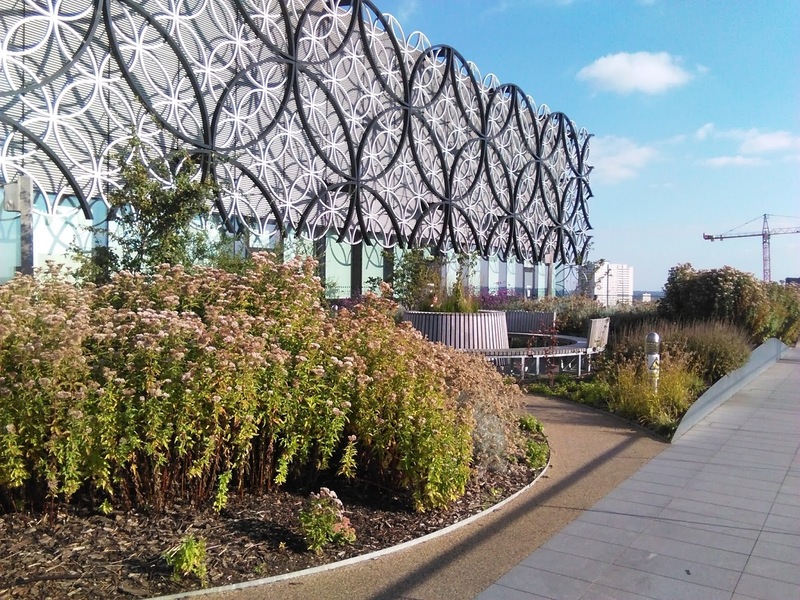 Roof garden of the library gives panoramic views of the city. From the library roof garden. Nb Valerie in Cambrian basin. Spring Hill library opened in 1893. In 1895 a man was sentenced to 6 weeks in prison with hard labour for throwing books inside the library. Nowadays that man could throw groceries around as Tesco have managed to join their store onto the library. They both now share a common entrance. The library survived being demolished by road improvements but somehow bloody Tesco managed to attach some glass and metal to a piece of historic Brum. The Cube. The view from above shows it`s not the shape you first think. 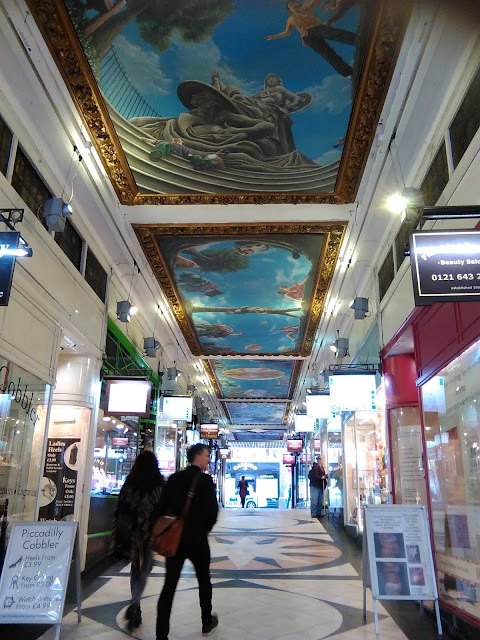 Inside the arcade with it`s painted ceiling. 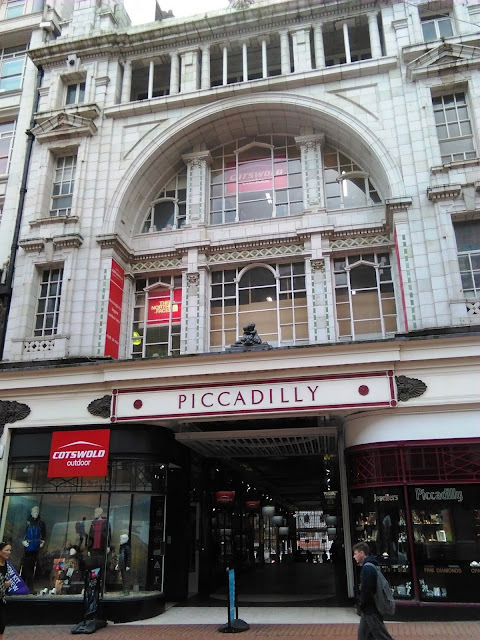 Originally built as a cinema in 1910 the sloping walkway is all that`s left of where the seating used to be sloping down to the screen. 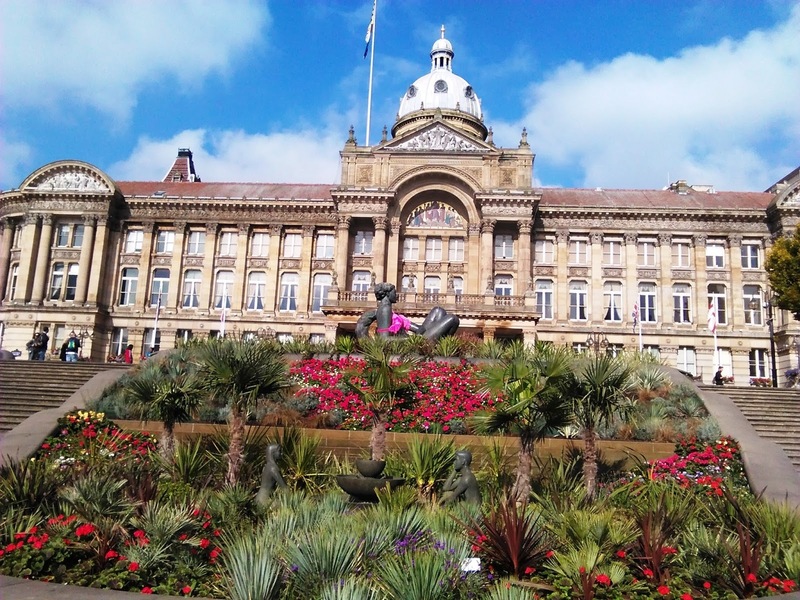 Birmingham City Council House opened 1870. The floozie in the jacuzzi has a pink bra courtesy of the "Ladies fight breast cancer" charity. 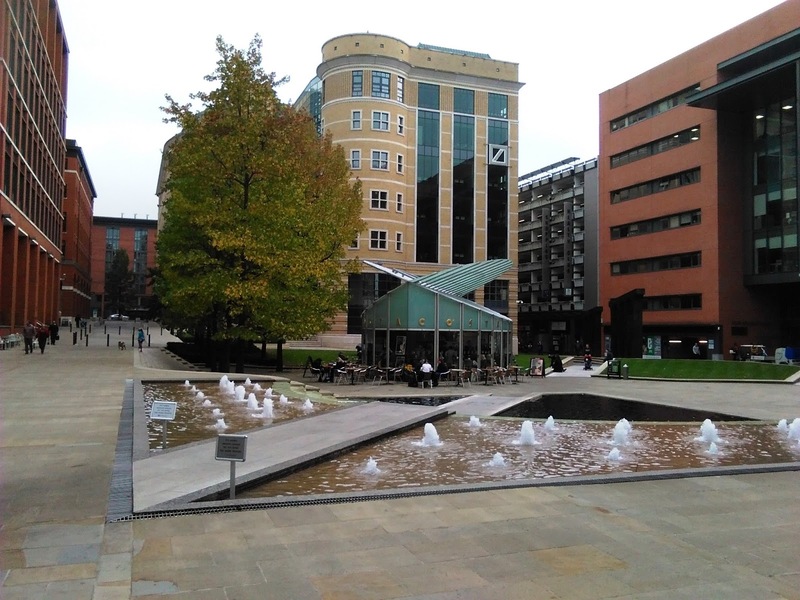 Click here to see a photo gallery of the garden in it`s water feature days. The Bell Edison telephone exchange dates back to late 1800`s. So much detail was put into these old buildings. Compare to the plain boring buildings in the next picture. Brindley Place with an unusual roof line on the Costa coffee building. Leaving Birmingham both canal and railway about to enter a tunnel. Around Birmingham city a lot of the canal bridges feature these Red panels. They date back to WW2 when the fire service would put hoses down into the canal for water to fight fires caused by bombing. Evidently the fire service still have keys for these doors but nowadays the water main system at street level would be sufficient most times. My camera is pants, but you still can see the Kingfisher's brilliant beauty. In Greek mythology there is a legend of a woman named Halcyone and her husband Ceyx. Shortly after their wedding, Ceyx had to make a voyage. A storm arose during the voyage and Ceyx was drowned. Every day that he was gone, Halcyone walked the shores of the beaches, longing for her beloved. After several months the body of Ceyx washed ashore. Halcyone was so filled with grief, she threw herself into the ocean. The gods were moved by her love and grief, and they turned Ceyx and Halcyone into Kingfishers. It was declared that the seas would be calm and the sun would shine for seven days before and seven days after the Winter solstice. This time came to be known as the Halcyon days. In our modern times, all calm, sunlit days upon the water are considered Halcyon days. The Kingfisher is an ancient symbol of peace and prosperity and the female is always more colorful than the male--a reversal from the way most birds are commonly colored. After resting up a few days in Lapworth we cruised back into the basin to dump our rubbish and fill up with water. Yesterday morning offered a break in the thick fog punctuated by rain that has swaddled the country for days on end. We decided to make a move while we could enjoy it in relative comfort. The Kingswood Junction 48 hour moorings as well as the 14 day moorings now designated four month winter moorings were completely empty, and not a single boat other than NB Valerie was on the move. While the water tank filled, we stood outside enjoying the crisp, mild weather. 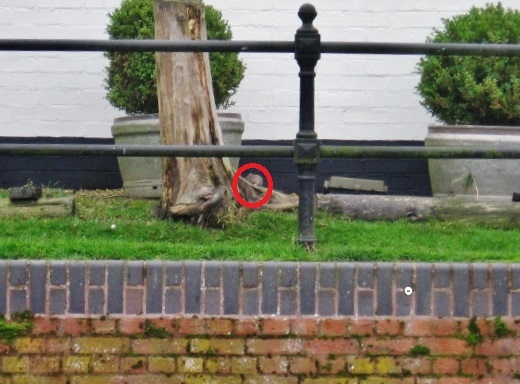 Suddenly Les spotted a large rat traversing the nearby low deck wall of the barrel roofed house fronting the canal basin. I retrieved my binoculars and sure enough, there were several of the brazen things which had clearly made a nest underneath the cottage decking. As we watched they scurried back and forth around the outside perimeter of the cottage, climbing up a low tree stump at one point, for a better view. Creepy! The barrel Roofed cottage at Kingswood Junction Basin. The water point is off to the right. Close up of the cottage garden fronting the canal and a rat! 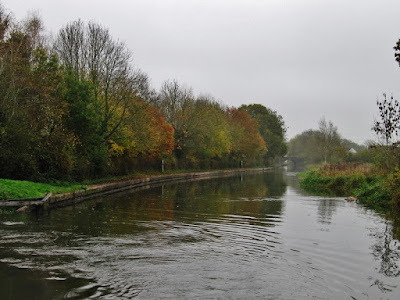 We left the basin for the Grand Union main line and cruised south toward Hatton Station--a good place for me with my bad knee, to get the train down to Warwick for another physio appointment. It is also an excellent spot to have Tesco deliver groceries. According to our Waterways Routes e-maps, it took us an hour and twenty minutes to cruise four and three quarter miles at an average speed of 3.13 MPH, dropping down to 2.6 MPH when passing the lines of moored boats at Tom 'O' the Woods, and the Middle Warwick Yacht Club. As we came out of Shrewley tunnel into a short cutting encompassed by tall banks and trees on both sides, Les spotted a Kingfisher perched on a nearby tree branch. We glided slowly by as I snapped pictures with my crappy camera. 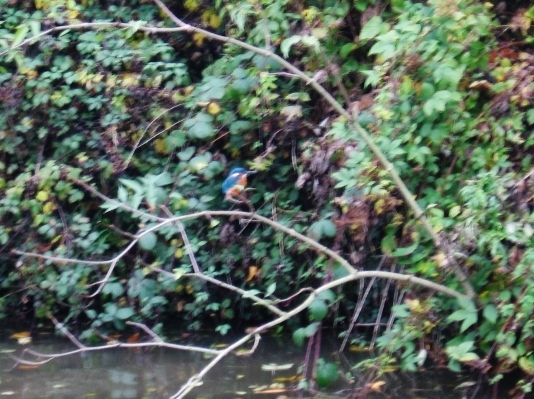 We hadn't gone more than 25 yards when we saw another Kingfisher perched along the cut! 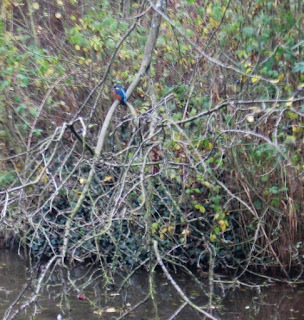 A two Kingfisher day is a fine day indeed! 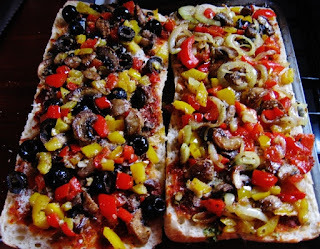 After we moored up, the break in the inclement weather held so while Les sawed lengths of Cherry wood into logs and split them, I made our main meal of the day: Ciabatta Pizza. We love pizza but as most boaters know, it isn't available for delivery to a narrow boat on the move, and store bought pizzas taste like cardboard compared to homemade. It is also difficult to find room to store round pizzas in a small boat fridge, and there is certainly no room in the freezer. Here then is my way of solving these issues. Any other bits and bobs you like on your pizza! Run a sink of hot, soapy water to wash up as you go along. Not only is it really a necessity in a small kitchen or galley, it means you will sit down to dinner with all the washing up done except your dinner dishes. If you are serving tossed salad with your pizzas, then this is the time to prepare them. I mix the basic bits in a large bowl. Then I put the greens and things in individual salad bowls and finish them up separately as Les like tons of raw onion and some grated carrot on his salad. He dislikes fresh tomatoes and I adore them, along with cucumber and radish. We also use different dressings. Once each salad is made I dress them and set them on the table which I also set now as I won't have time once I get cooking. Chop and slice all your toppings. I use small Pyrex custard cups. I have a set of eight and they work well for mis en place, which means everything in its place. Chopping and prepping ingredients ahead of time allows me to be better organized in a small galley kitchen. It allows me to clean up the cutting board, and tidy up the counter. Everything I need is ready to hand and I can just get on with cooking. Part baked rolls and breads are brilliant and I never saw their like back in Washington State grocery stores. They keep well until needed and are easy to store. 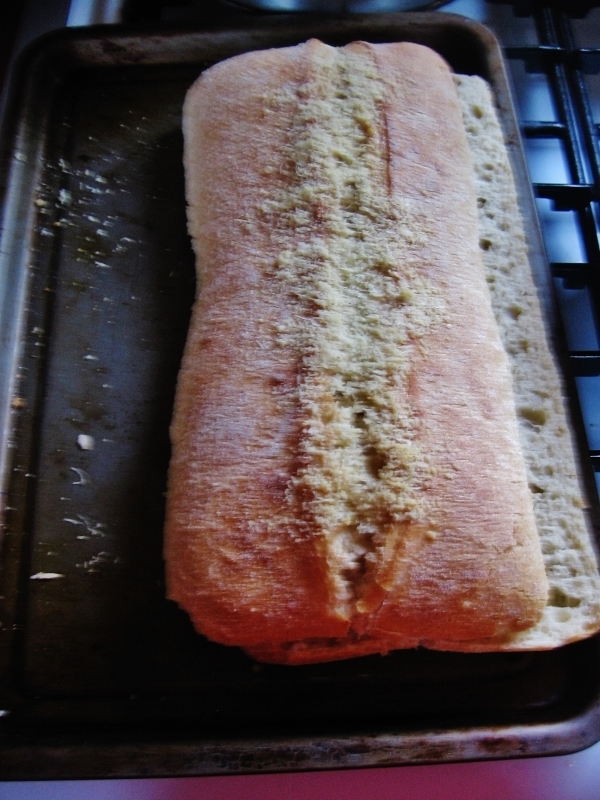 Just pre-heat the oven to gas mark 7/425 F, place the bread on a baking sheet and pop it in the oven for seven minutes! Viola--fresh baked bread! 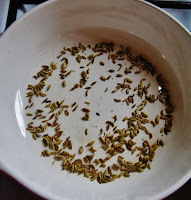 While the bread is baking, toast 2 T. of fennel seeds in a small pan without any oil on high heat. Be careful not to burn them. Pour the toasted seeds in a mortar and pestle and grind them into powder. Sauté your vegetable toppings. Les and I like different things. He prefers onion, mushrooms, and peppers. 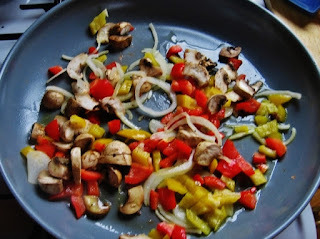 I like black olives, mushrooms and peppers, so I sauté each person's toppings individually, in 2 T. of olive oil until the veg is soft but not browned, about 5-7 minutes. Two minutes before removing them from the stove, sprinkle with 1 T. of oregano, and 1 T. toasted, ground fennel seed. Stir in, and remove from heat after two minutes and set aside in a bowl. 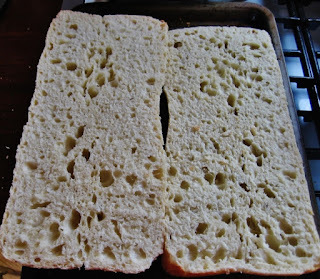 When the bread is baked, remove it from the oven and set it aside while you finish sautéing the veg. While the bread is still warm but no longer too hot to handle, slice in half length wise and lay each piece side by side on the baking sheet. 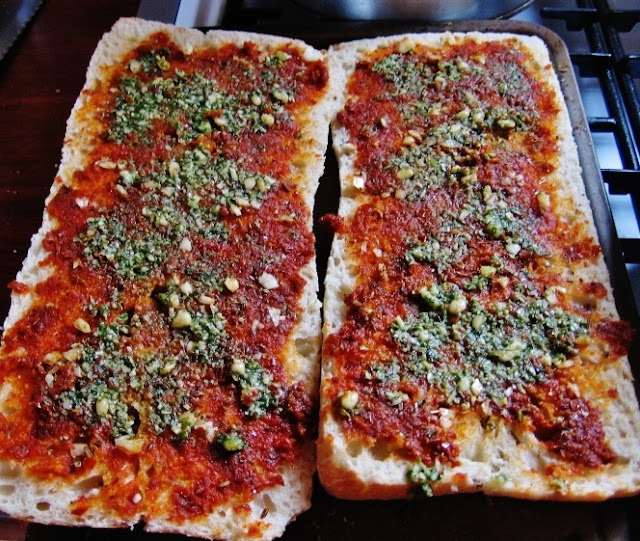 Spread as much Sacla Intense Sun Dried Tomato sauce as you prefer over each side of the Ciabatta. 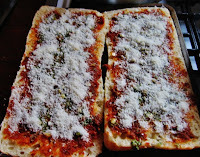 Sprinkle fresh diced garlic across the tops, and follow up with very small spoonfuls of Pesto. Using a small rubber spatula, make sure to spread everything evenly across the surface of the bread. Sprinkle finely grated Parmesan or Grana Padano over the sauce on each side of the Ciabatta, then top each with the sautéed vegetables. 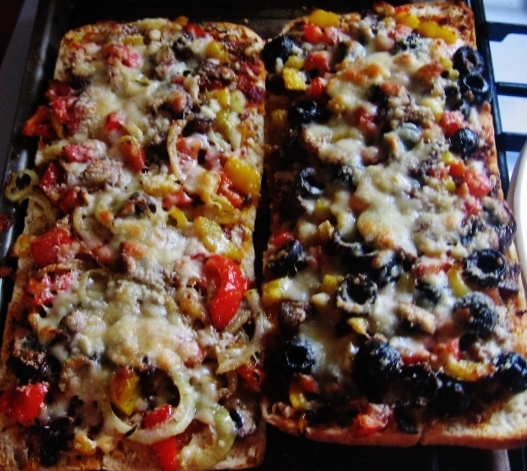 Sprinkle shredded cheese over the tops of both sides. Be liberal with it so it melts over the veg and down into the crevices between each bit. 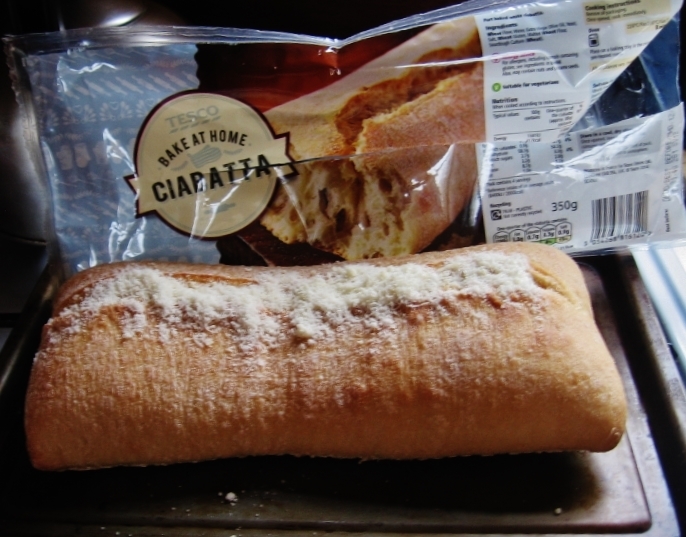 Place the ciabattas in the oven on the top shelf at Gas Mark 7/425 F for seven minutes. You may need to turn the pan to ensure even melting and browning of the cheese. If so then keep a close eye on things. Set a timer for three minutes--no longer--and then remove the pizzas from the oven. Mmmmm! 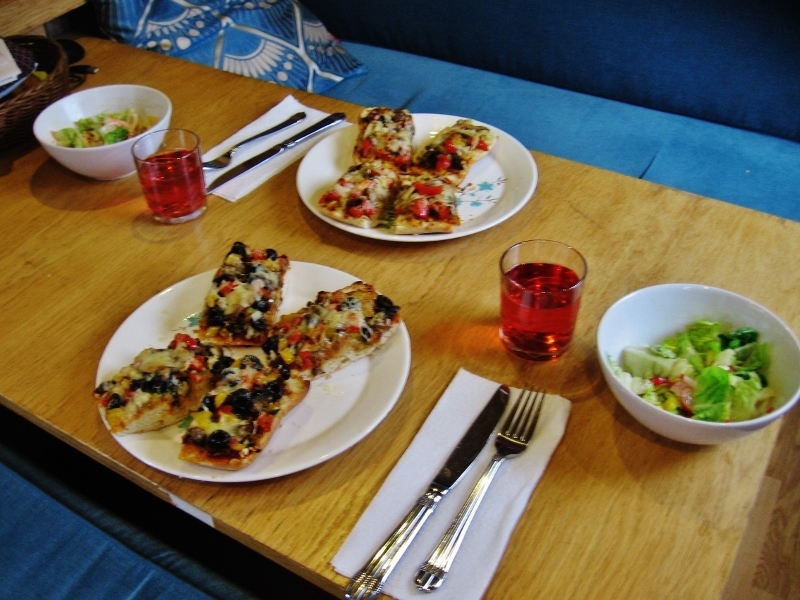 Fresh baked Ciabatta Pizza direct from the oven, appearing in your kitchen. YUMMY! There you go! 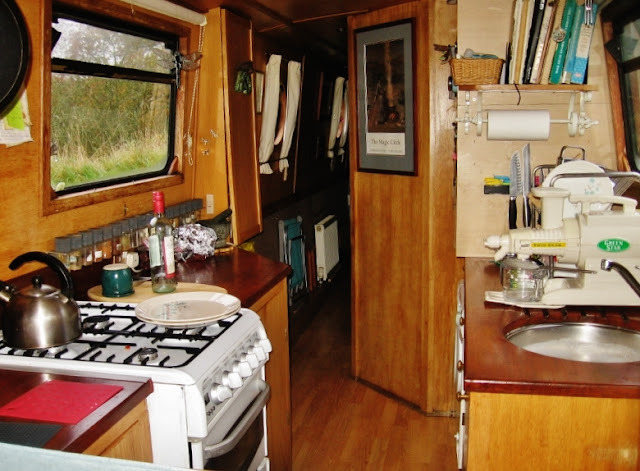 A clean and tidy galley and dinner is ready to eat. Pour some wine and Bon Appetit! Les was busy sawing and chopping wood while I cooked. Warm food in our bellies and a warm boat with all this lovely wood!